The other day I was reading from The Fringe Hours by Jessica N. Turner and I was deep into the section about comparison and how toxic it can be...if you allow it. I felt moved to share my thoughts with you about this subject and I hope you'll weigh in on the topic because I'd love your feedback!! With that said, we are all broken. We are all imperfect. 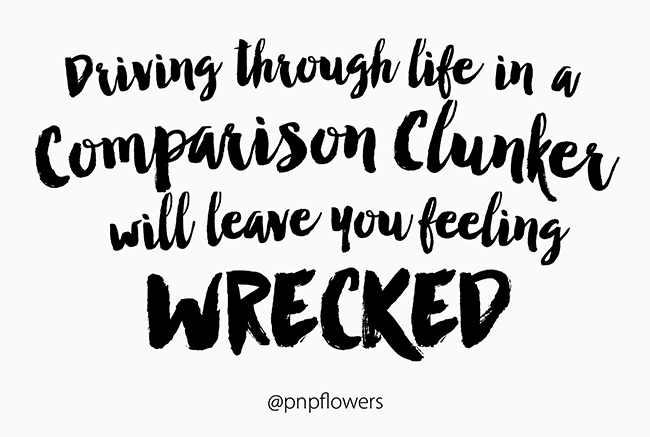 And we can all easily find ourselves behind the wheel of what I call the Comparison Clunker. There are the "Pinterest Potholes" that leave us feeling deflated, the social media traffic jams filled with all things shiny + faster + better that leave us feeling out of gas and then there's the "race to the finish" mindset of our society that causes us to grip the steering wheel so tightly that we often spin out of control and end up finding ourselves wrecked on the side of the road...helplessly watching the rest of the world speed by. It can really feel that way...IF we let it. • Comparison is doing just as much damage as guilt can often do to a woman. • Comparison can eat away at us, distract us from our blessings and our need for self-care. • We see others who seem to be doing it all and have it all with what looks like little effort, so we think that is what our lives should look like as well. • On social media, comparison is a catalyst for nagging feelings of disappointment, discontentment, frustration, and self-doubt. • Pinterest cannot be your yardstick for who you are as a woman, what you should love, how you should cook, or what you should prioritize. It cannot be your yardstick for good parenting, thoughtfulness, or really anything in life. That's good stuff right there!! Am I right?! So how do we kick the Comparison Clunker to the curb? "Have you ever looked at another woman and judged something about her? Maybe it was the fact that she brought a store-bought dessert to the church potluck while everyone else brought homemade. Or maybe you judged a woman because you didn't feel like she was dressed appropriately. Or because you disagreed with the way she parented her children." For me, I've come to the conclusion that judgment is often the act of deflecting our own ridiculous expectations + standards onto unsuspecting, innocent bystanders. I shamefully admit I am guilty of this - not 100% of the time but most certainly more often than I care to admit. 1. Finding and recognizing the root of your judgment. Once you've been able to determine the true emotion, (envy, dissastifaction, etc. ), behind the judgment you are more likely to take a step back, turn the initial judgment into something different...something positive and perhaps be inspired to take the time to get to know the person and their story...which will lead to acceptance...and ultimately love. 2. Trading judgment for celebration. I have to tell you, I immediately thought..."Oh I can do that...I already do that." And there are plently of women out there I know who do it as well. But then I took a minute, from a personal perspective, to dive deeper into what "celebrating others" should really LOOK like and more importantly what it should FEEL like. Ask yourself this the next time someone you know, admire or follow on social media posts or shares something exciting about something they've accomplished and are proud of. • Do you jump right up and offer them praise and support? Or do you pause? • Do you "like" their post immediately and leave an encouraging comment? Or do you scroll past and then scroll back up after the guilt sets in? "Liking" or "commenting" can LOOK as though you are celebrating that person...BUT are you really? Do you look like her cheerleader but then find yourself judging her creativity, styling, home decor picks, baking, handwriting, art, parental decisions, hair style, weight, shoes, clothing, etc.? The way you FEEL - what's coming from your heart - and the driving force behind your celebration of another person's successes are even more important than the act of you celebrating with that person. Or will you be sincere? I have to tell you, from personal experience, I have been on both sides of the coin. I have had superficial support from people I thought were my friends - & that feels pretty crappy. I've also had sincere support - which feels WAY better and feels noticeably different. I think we all know when we are GETTING superficial and when we are GIVING it too. 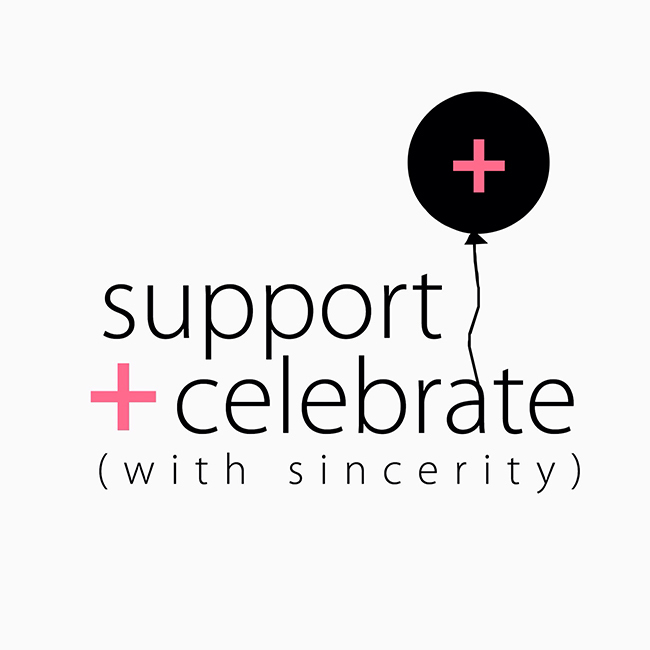 With all of this weighing heavy on my mind...I've decided to really make this "Support + Celebrate - with sincerity" something I'm doing and thinking about on a more consistent basis. If I feel judgment more than I feel genuine...I plan to correct that...immediately. I'd love to hear what you think about the subject of comparison and your own experience with it. I'm loving The Fringe Hours book and highly recommend it. It's been very thought-provoking and inspiring. xoxo - my sweet friends!! This post was written and has been sitting for over 2 weeks. Various projects, life and some challenges have kept me away from the blog. I'm so glad I came back to it today because I needed to hear this all over again. I feel so inspired...I hope you do too! !